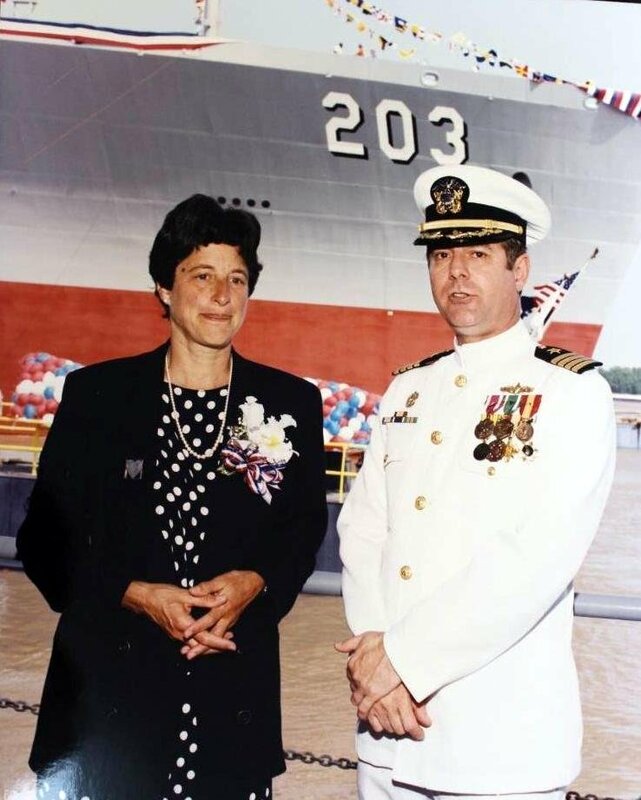 Laid down, 10 January 1994, at Avondale Industries, Westwego, LA. 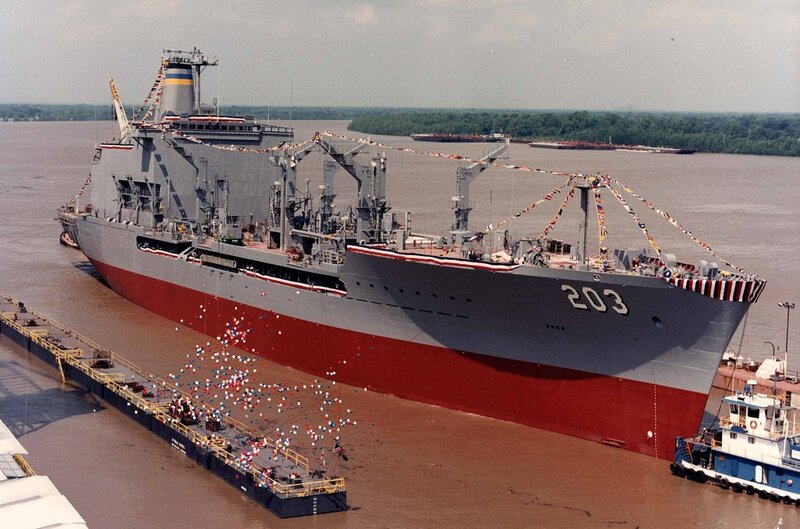 Placed in service with the Military Sealift Command (MSC) as USNS Laramie (T-AO-203), 7 May 1996. 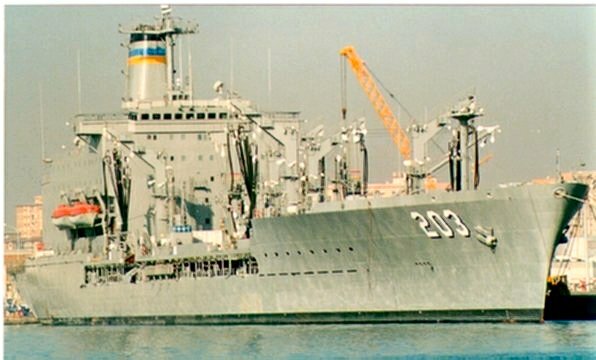 39k USNS Laramie (T-AO-203) moored pierside, date and location unknown. 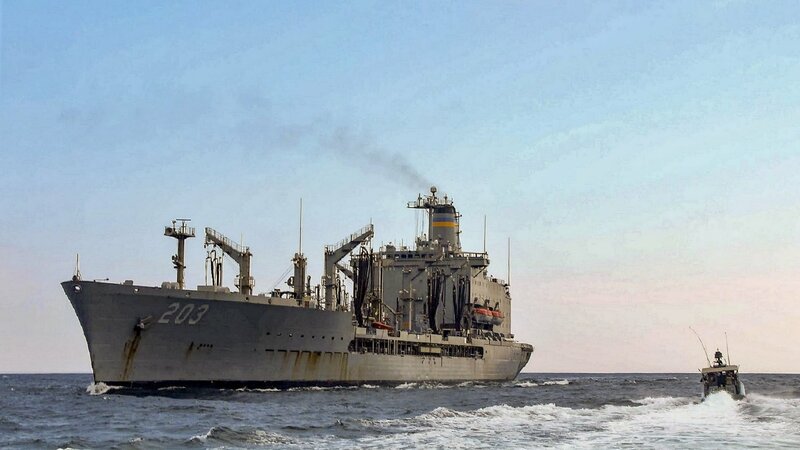 41k USNS Comfort (T-AH-20) refueling from USNS Laramie (T-AO-203), date and location unknown. 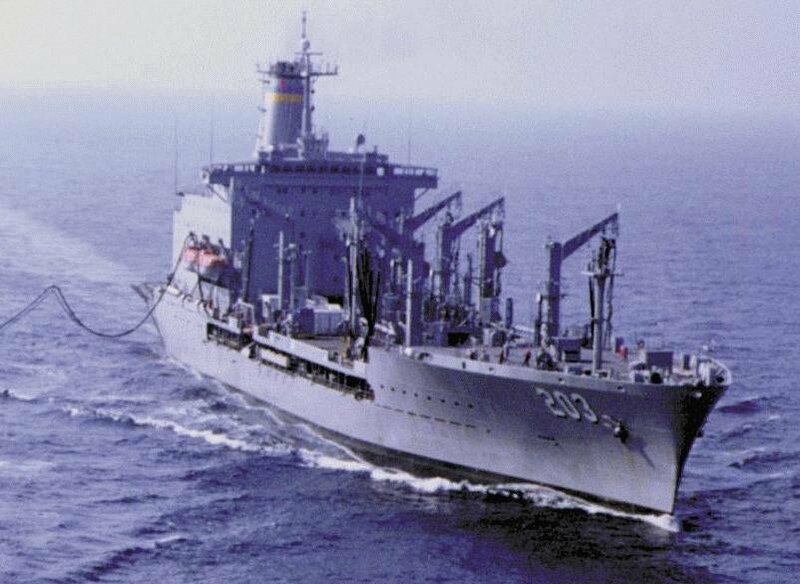 86k USNS Laramie (T-AO-203) underway, date and location unknown. 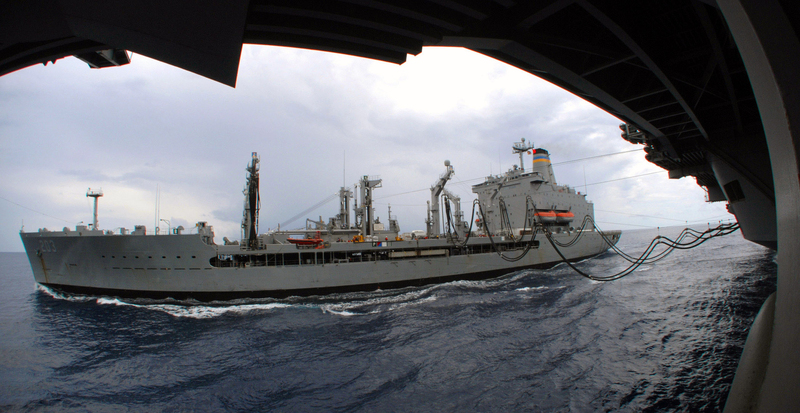 579k USNS Laramie (T-AO-203) and USS Ponce (LPD-15) prepare to begin an underway replenishment, 20 June 2007. Ponce is underway in preparation for an upcoming deployment. 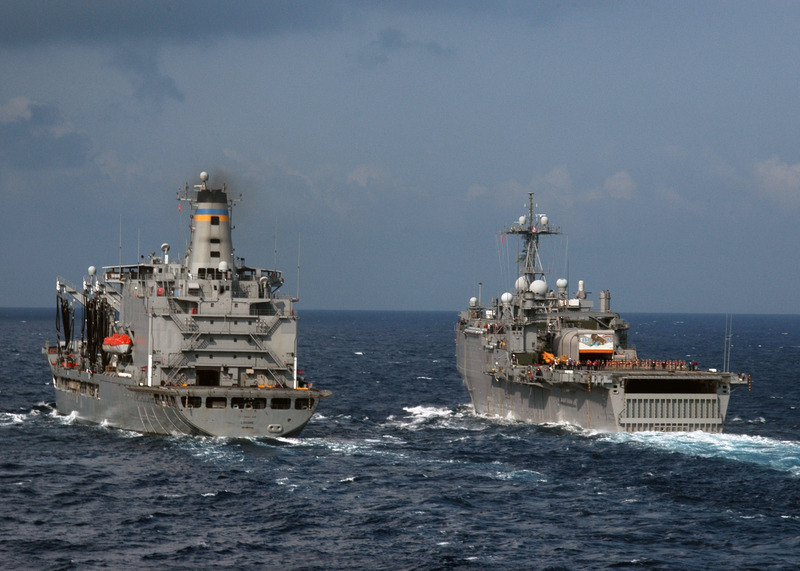 1015 USNS Laramie (T-AO-203) alongside the Nimitz-class aircraft carrier USS Harry S. Truman (CVN-75) during a replenishment at sea, while under way in the Atlantic Ocean, 25 July 2007. Truman is participating in Operation Bold Step, a joint task force exercise with more than 15,000 service members from three countries. 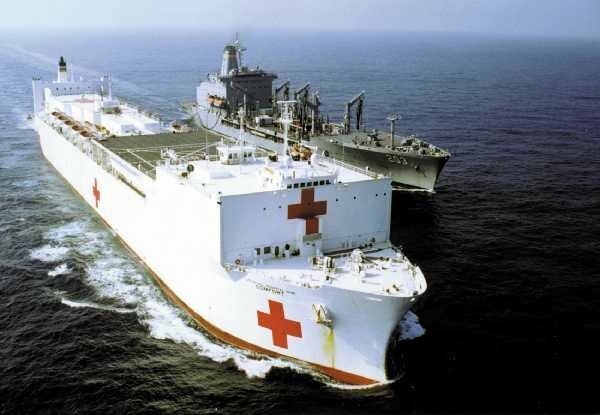 570k USNS Laramie (T-AO-203) sails near the aircraft carrier USS Theodore Roosevelt (CVN-71) for a replenishment at sea during a tailored ship's training availability and final evaluation problem, 20 March 2008 in the Atlantic Ocean. 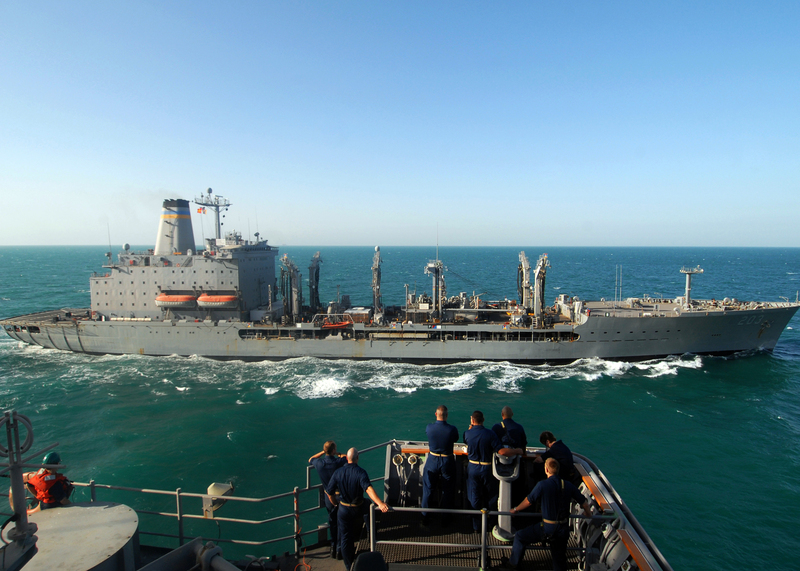 766k USNS Laramie (T-AO-203) pulls alongside the aircraft carrier USS Theodore Roosevelt (CVN-71) for a replenishment at sea during a tailored ship's training availability and final evaluation problem, 1 April 2008 in the Atlantic Ocean. 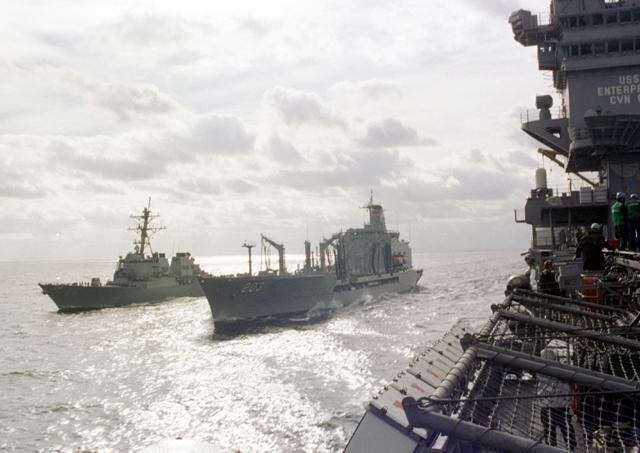 459k USNS Laramie (T-AO-203) steams behind the guided-missile cruiser USS Vella Gulf (CG-72), not pictured, after a replenishment at sea, 17 September 2008. 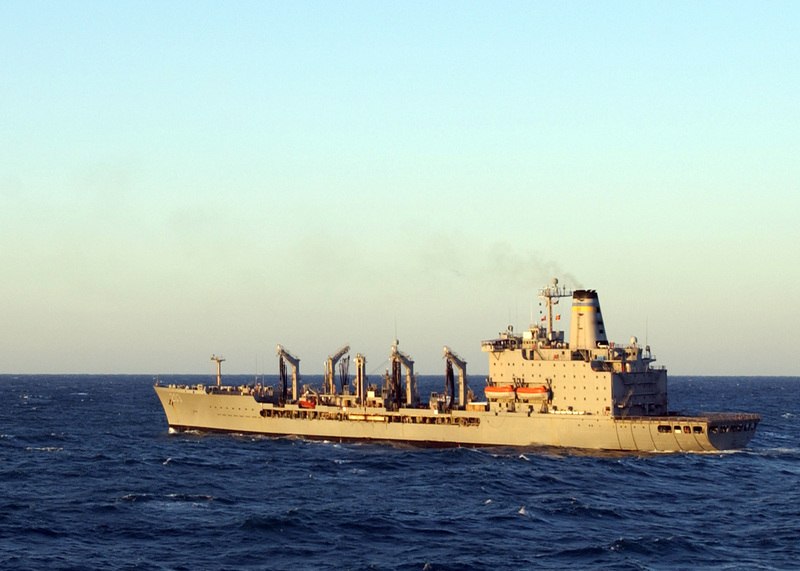 1672k USNS Laramie (T-AO-203) steams through the Mediterranean Sea preparing for a replenishment at sea with the amphibious transport dock ship USS San Antonio (LPD-17), 22 September 2008. San Antonio is deployed as part of the Iwo Jima Expeditionary Strike Group supporting maritime security operations in the U.S. 5th and 6th Fleet areas of responsibility. 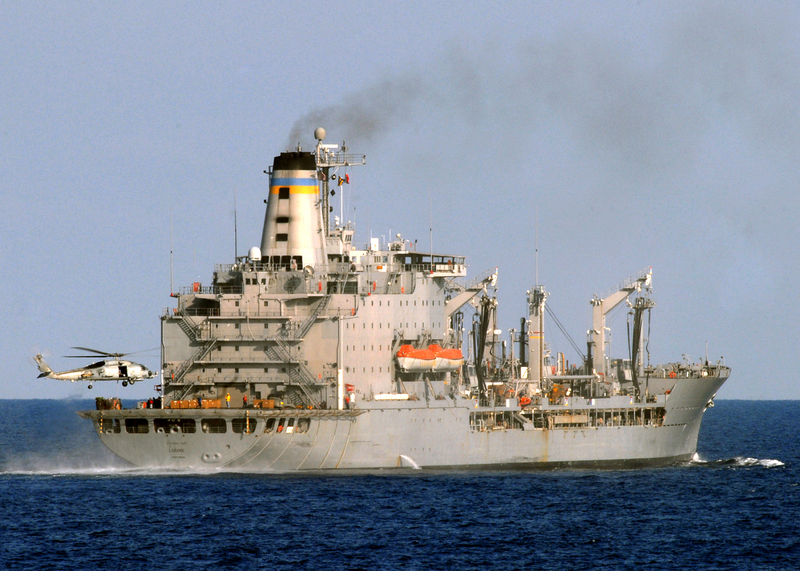 2540k An MH-60S Sea Hawk from the "Chargers" of Helicopter Sea Combat Squadron (HSC-26) conducts a vertical replenishment (VERTREP) with USNS Laramie (T-AO-203), 22 September 2008. HSC-26 is deployed with the multi-purpose amphibious assault ship USS Iwo Jima (LHD-7) as part of the Iwo Jima Expeditionary Strike Group supporting maritime security operations in the U.S. 5th and 6th Fleet areas of responsibility. 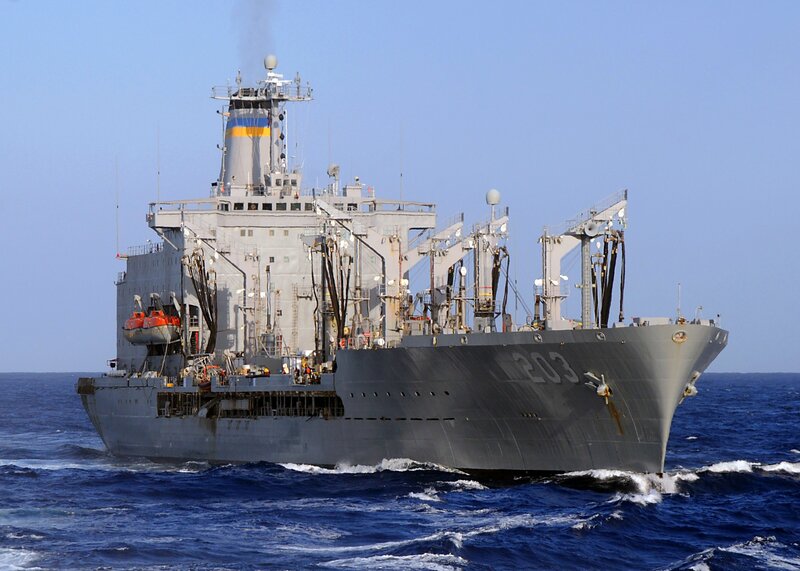 1857k USNS Laramie (T-AO-203) pulls alongside the amphibious dock landing ship USS Carter Hall (LSD-50) for a replenishment at sea. 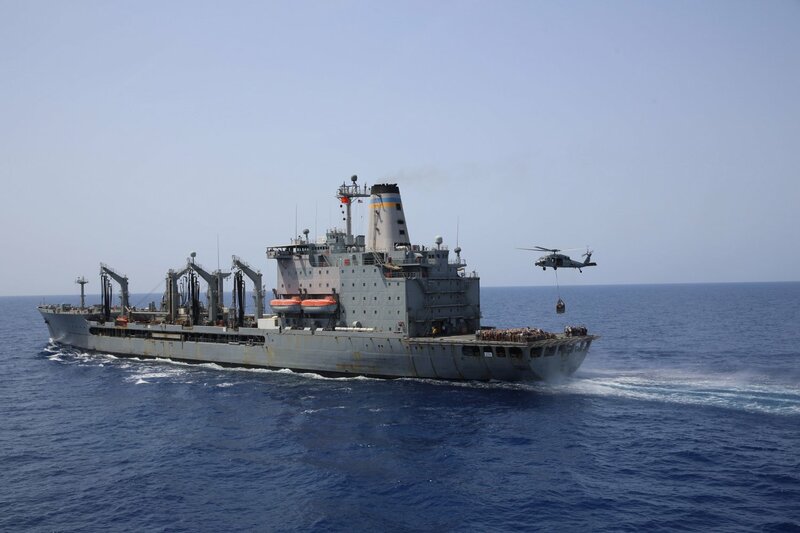 Carter Hall is deployed as part of the Iwo Jima Expeditionary Strike Group supporting maritime security operations in the U.S. 5th Fleet area of operations. 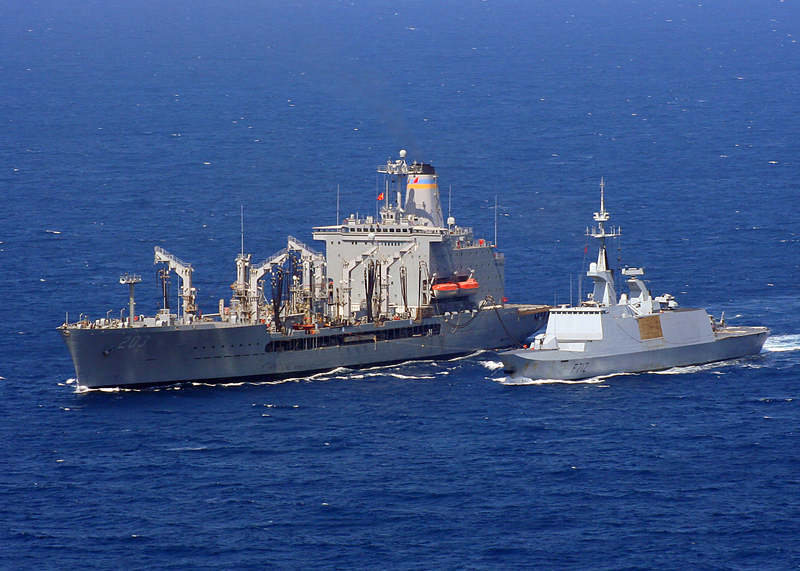 3383k USNS Laramie (T-AO-203) conducts a replenishment at sea with the French multi-mission stealth frigate RFS Courbet (F-712) in the Indian Ocean, 3 December 2008. 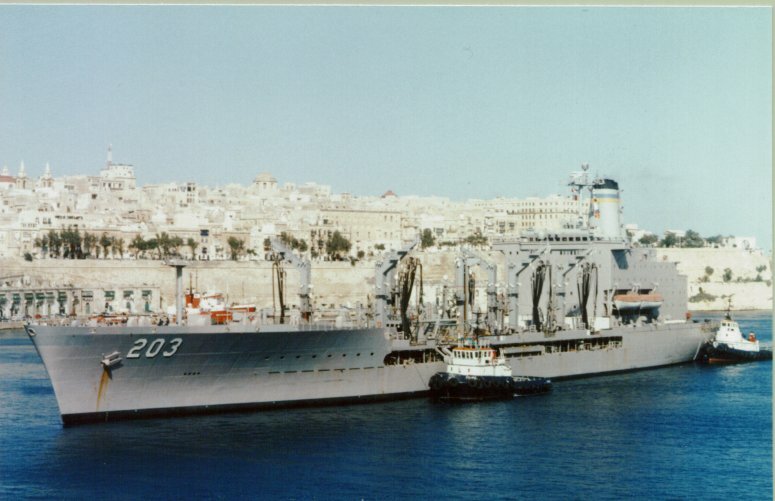 1975k USNS Laramie (T-AO-203) conducts an underway replenishment with USS San Antonio (LPD-17). 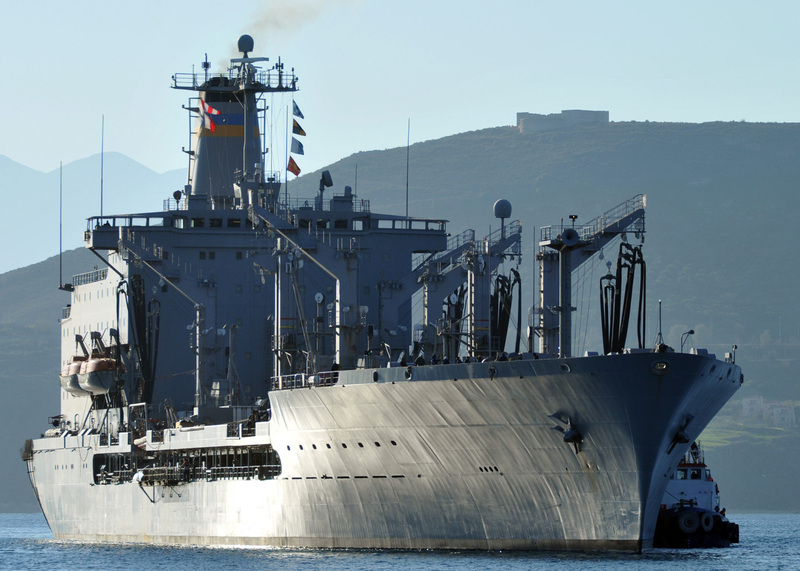 San Antonio is deployed as part of the Iwo Jima Expeditionary Strike Group supporting maritime security operations in the U.S. 5th Fleet area of responsibility..
695k USNS Laramie (T-AO-203) arrives in Souda Bay for a routine port visit. 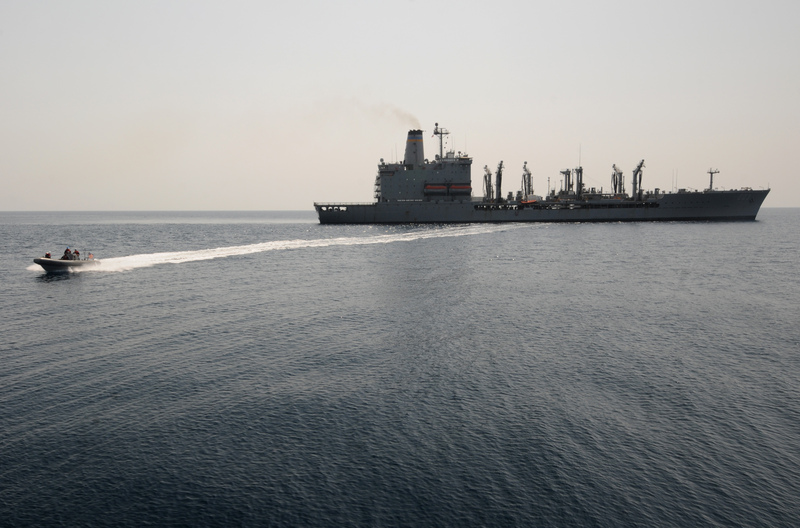 Laramie is on a scheduled deployment in the U.S. 5th Fleet area of responsibility conducting Persian Gulf and anti-piracy operations. 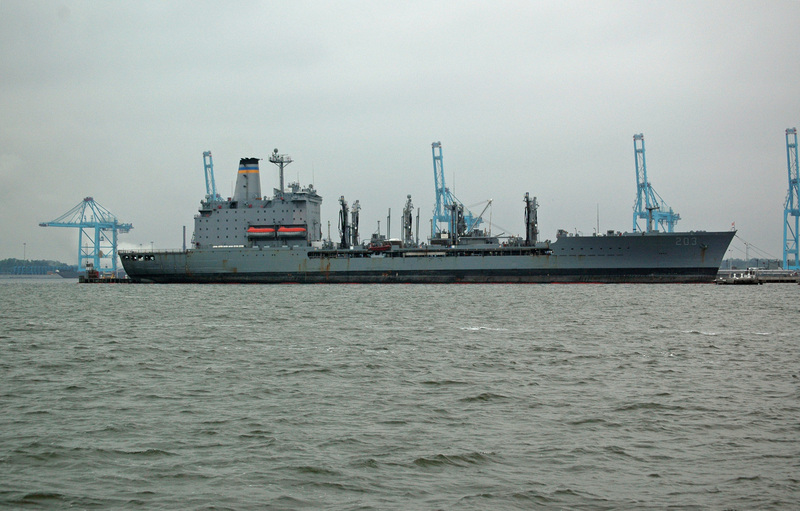 1828k USNS Laramie (T-AO-203) is underway in rough seas. 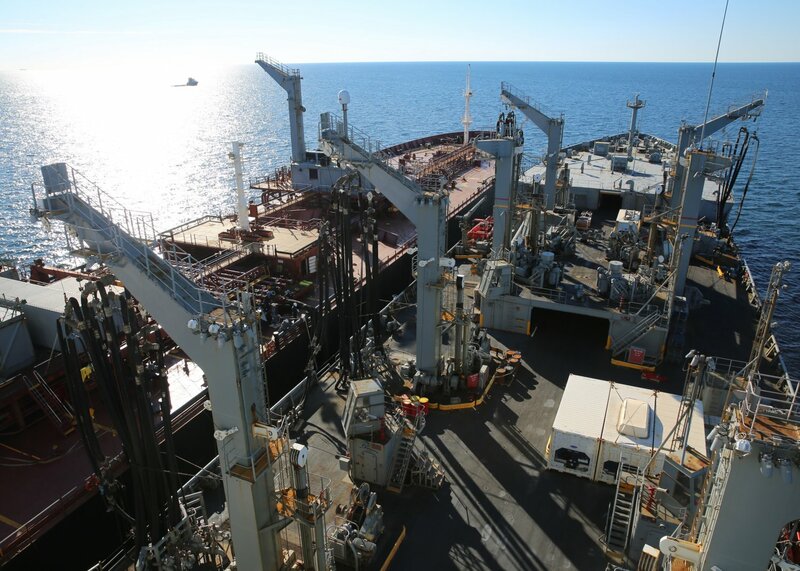 Laramie is conducting an underway replenishment with ships of the Harry S. Truman Carrier Strike Group. 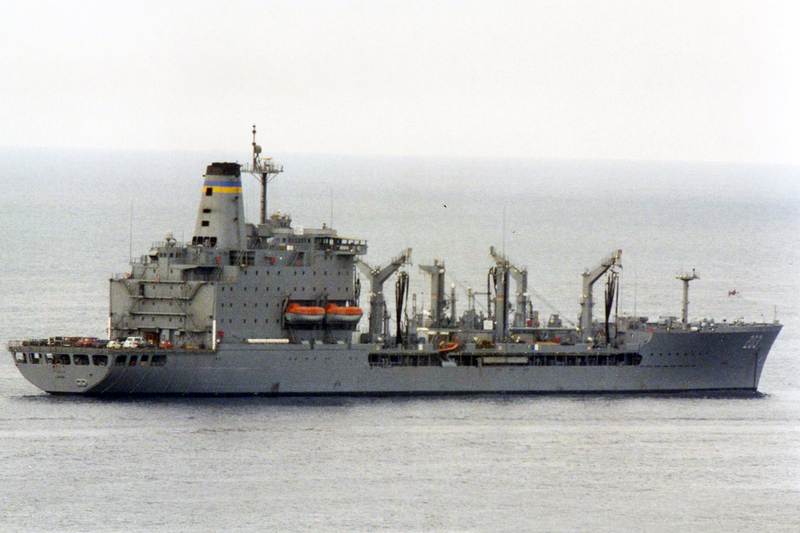 1909k The amphibious command ship USS Mount Whitney (LCC/JCC 20) comes alongside USNS Laramie (T-AO-203) for a replenishment at sea. 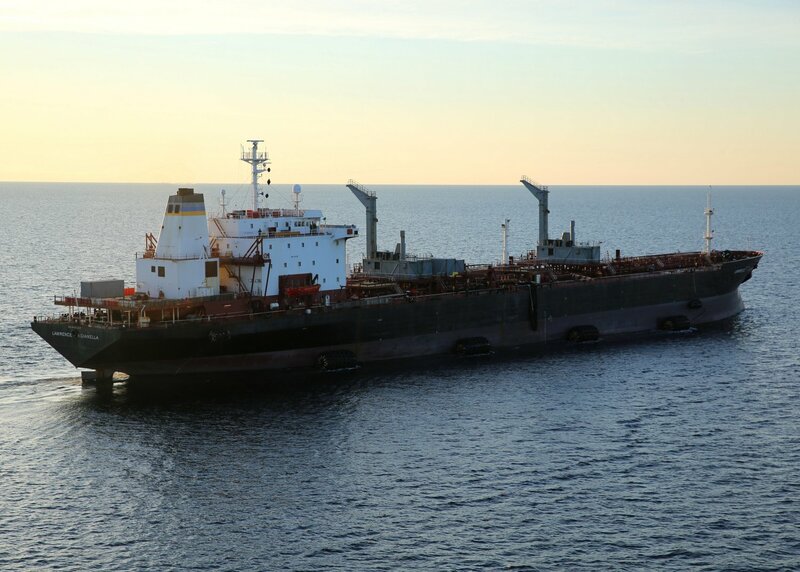 Mount Whitney is operating in the Mediterranean Sea in support of Austere Challenge 2010, a joint evolution designed to exercise U.S. capability across the full range of military operations in the European theater. Mount Whitney, the U.S. 6th Fleet flagship, is homeported in Gaeta, Italy and operates with a hybrid crew of U.S. 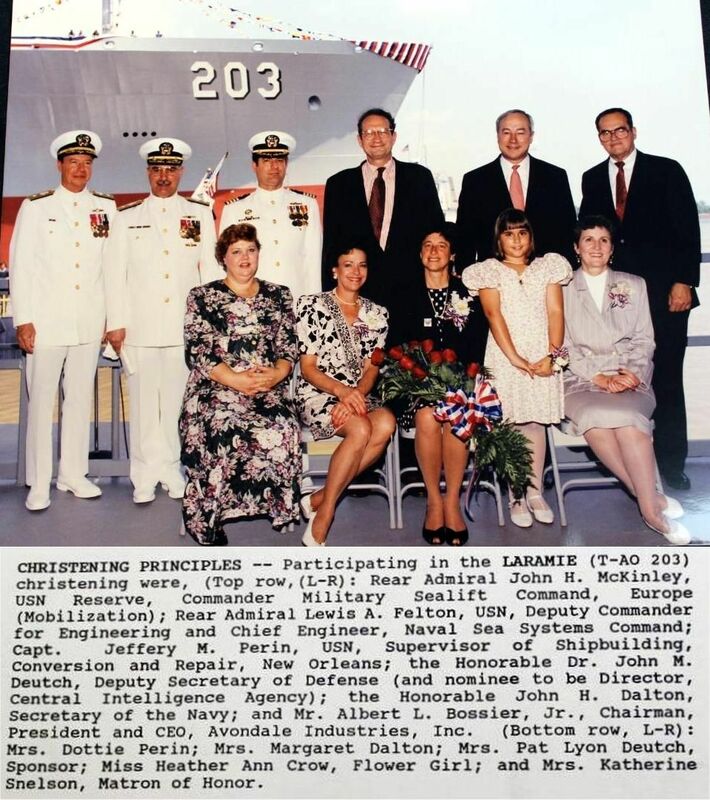 Sailors and Military Sealift Command civilian mariners. 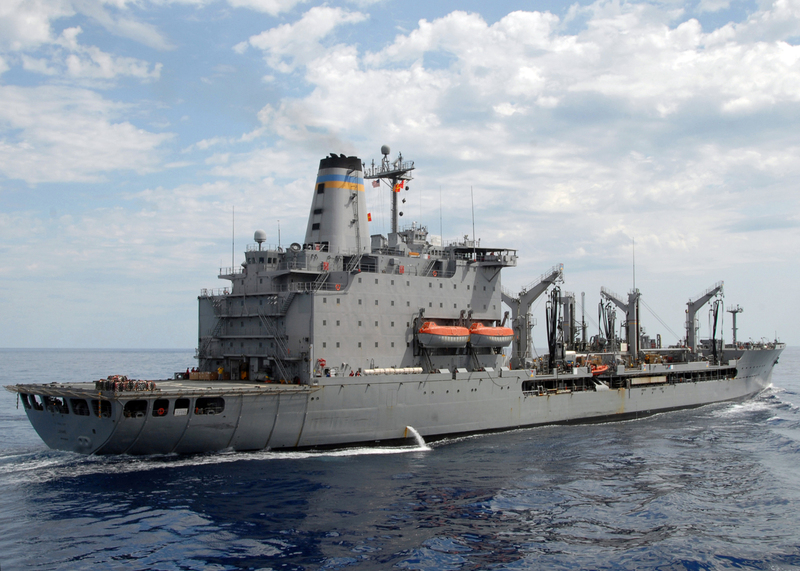 269k USNS Laramie (T-AO-203) conducts a replenishment at sea with the amphibious transport dock USS Mesa Verde (LPD-19). 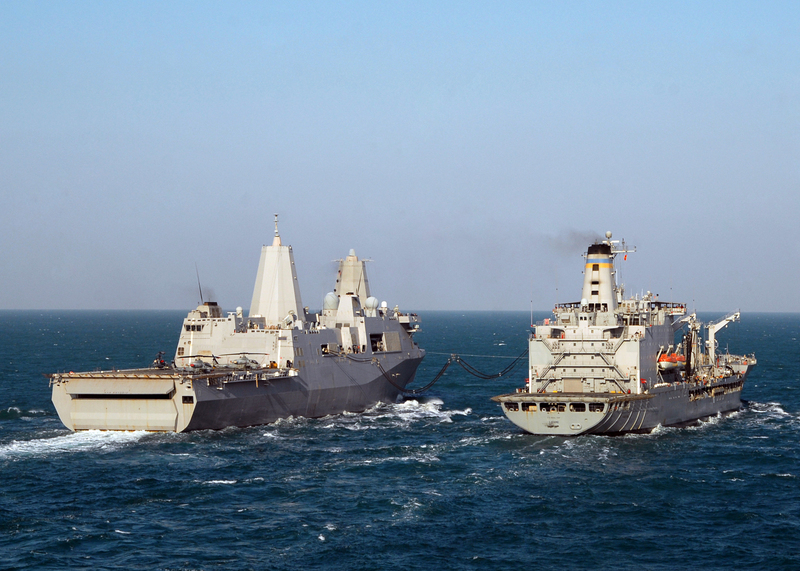 Mesa Verde is part of the Nassau Amphibious Ready Group supporting maritime security operations and theater security cooperation operations in the U.S. 5th Fleet area of responsibility. 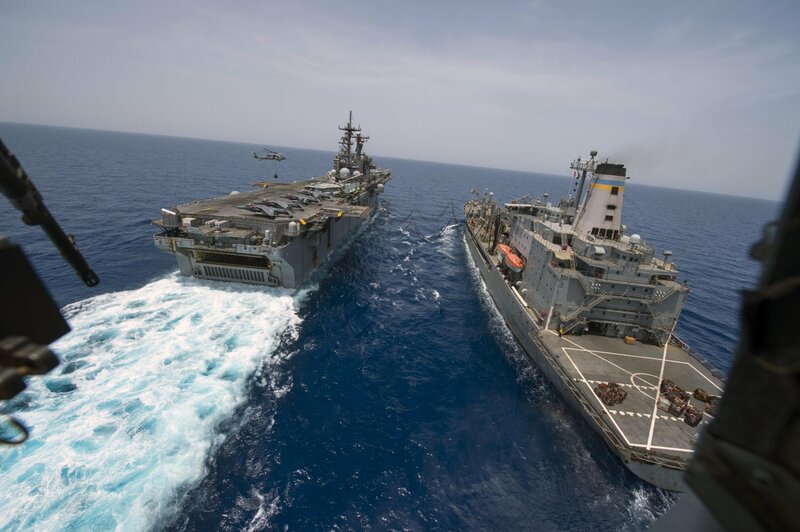 1279k The amphibious assault ship USS Bataan (LHD-5), left, receives fuel from USNS Laramie (T-AO-203) as an MH-60 Sea Hawk helicopter assigned to the Dragon Whales of Helicopter Sea Combat Squadron (HSC-28) delivers supplies. 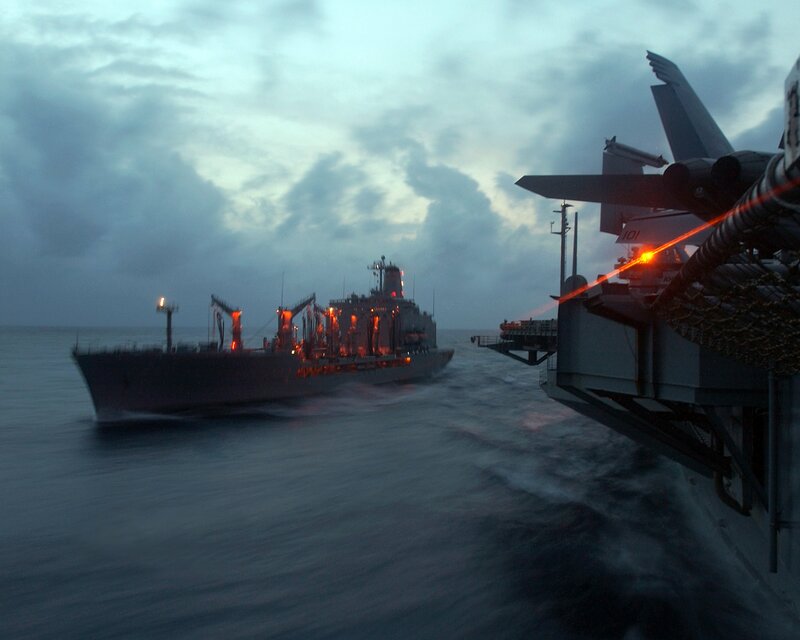 The Bataan Amphibious Ready Group is deployed in the Mediterranean Sea. 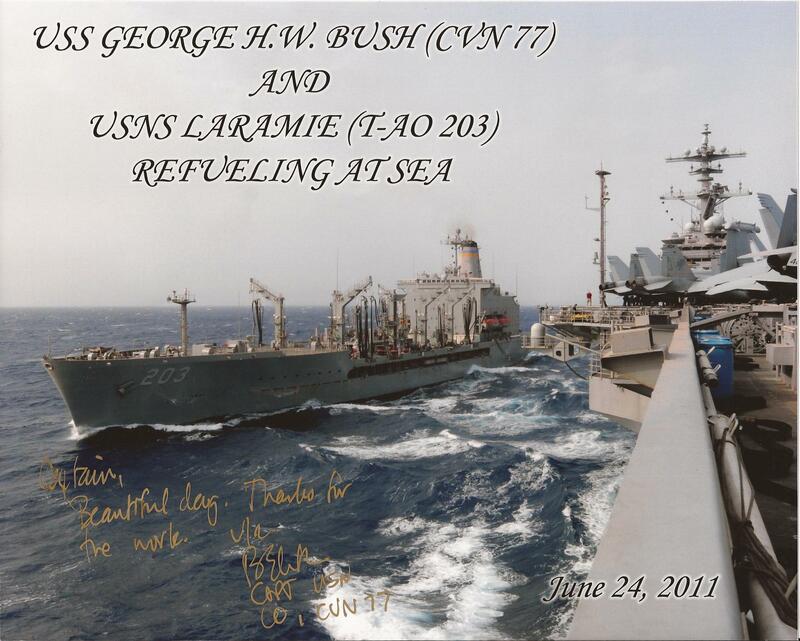 425k USNS Laramie (T-AO-203) alongside USS George H. W. Bush (CVN-77) during a replenishment at sea, 24 June 2011. 943k Sailors assigned to the guided-missile destroyer USS Mitscher (DDG-57) return to the ship in a rigid-hull inflatable boat after conducting a personnel transfer with USNS Laramie (T-AO-203). Mitscher is deployed to the U.S. 5th Fleet area of responsibility conducting maritime security operations and support missions as part of operations Enduring Freedom and New Dawn. 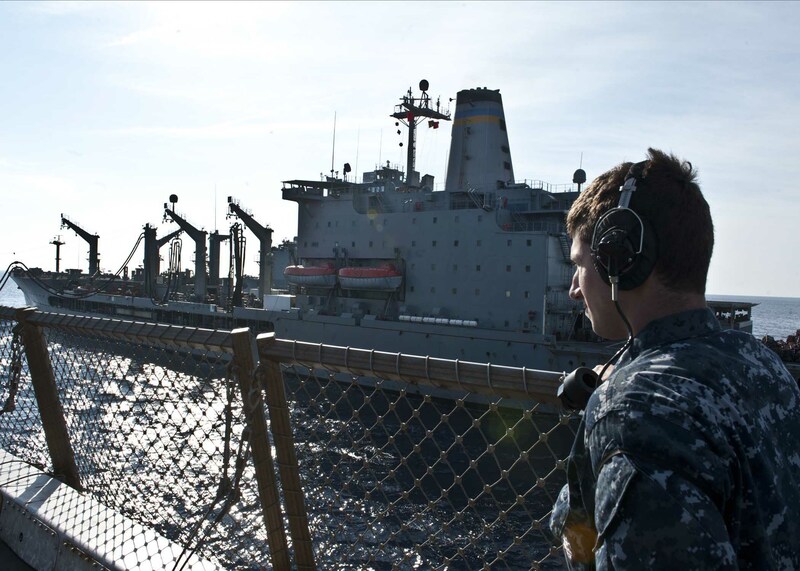 286k Logistics Specialist Seaman Edward Murphy stands as the aft lookout aboard the amphibious transport dock ship USS New York (LPD-21) during a replenishment-at-sea with USNS Laramie (T-AO-203). New York is part of the Iwo Jima Amphibious Ready Group with the embarked 24th Marine Expeditionary Unit (24th MEU) and is deployed in support of maritime security operations and theater security cooperation efforts in the U.S. 6th Fleet area of responsibility. 130522-N-RJ834-058 RED SEA (May 22, 2013) 188k USNS Laramie (T-AO-203) and an MH-60S Sea Hawk helicopter from Helicopter Sea Combat Squadron (HSC) 28, embarked aboard the amphibious assault ship USS Kearsarge (LHD-3), conducts a vertical replenishment-at-sea. 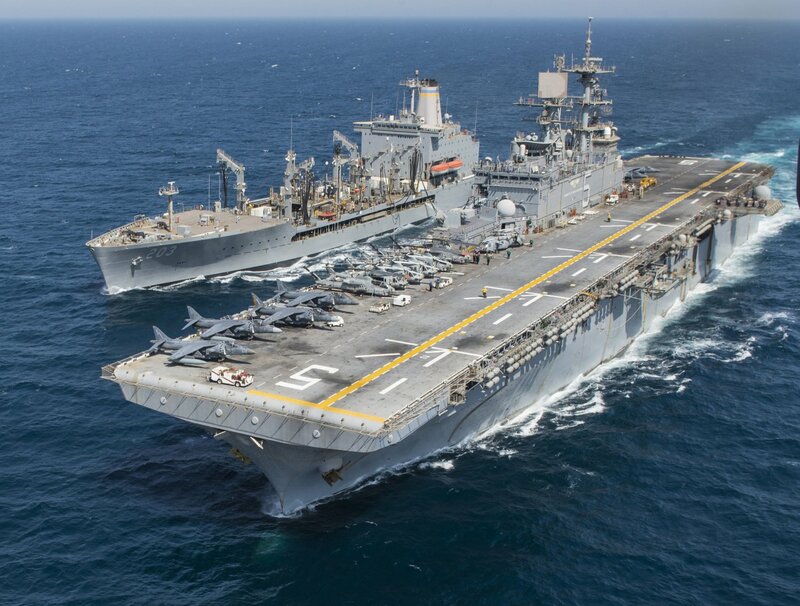 Kearsarge is the flagship for the Kearsarge Amphibious Ready Group and, with the embarked 26th Marine Expeditionary Unit (26th MEU), is deployed in support of maritime security operations and theater security cooperation efforts in the U.S. 5th Fleet area of responsibility. 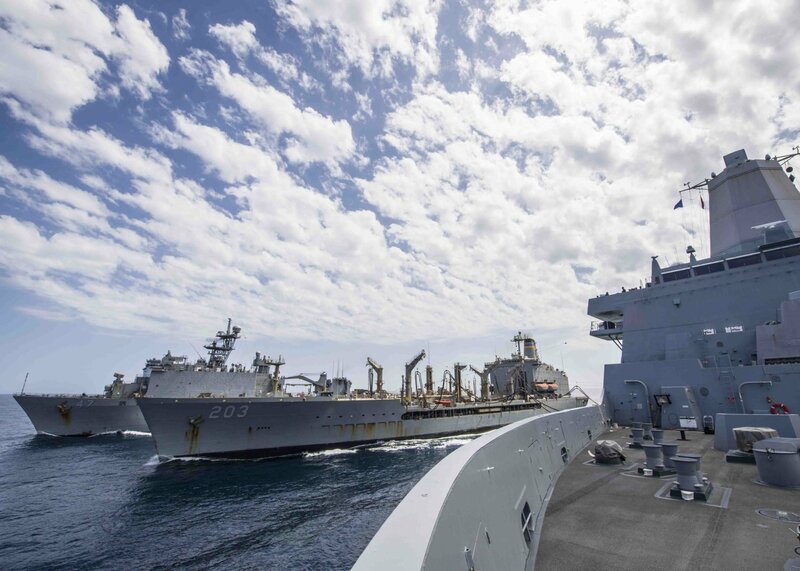 359k The amphibious assault ship USS Bataan (LHD-5) right, and the fleet replenishment oiler USNS Laramie (T-AO-203) conduct a replenishment-at-sea. 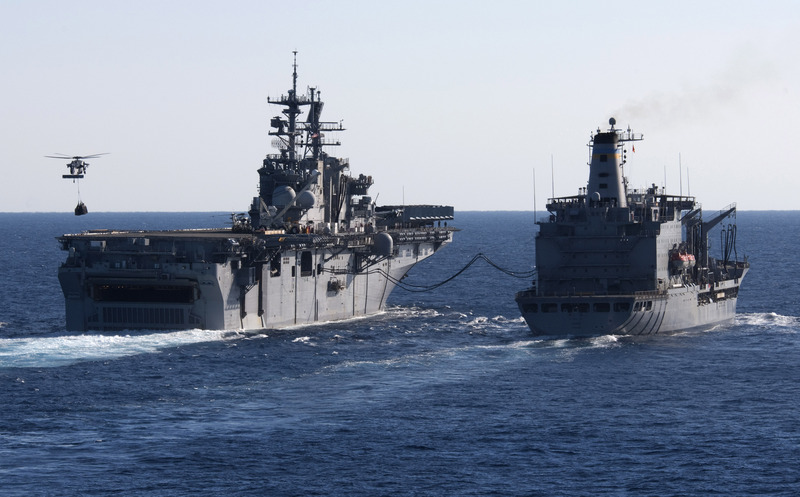 Bataan is the flagship for the Bataan Amphibious Ready Group and, with the embarked 22nd Marine Expeditionary Unit (22 MEU), is deployed in support of maritime security operations and theater security cooperation efforts in the U.S. 5th Fleet area of responsibility. 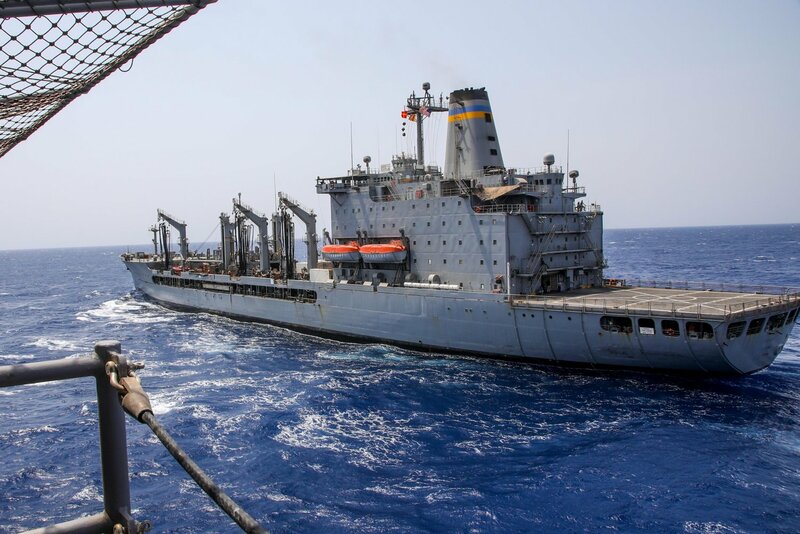 1306k Coastal Riverine Squadron (CRS) 10, forward deployed to Camp Lemonnier, Djibouti, Africa, conducts a personnel transfer off the Gulf of Aden with USNS Laramie (T-AO-203). 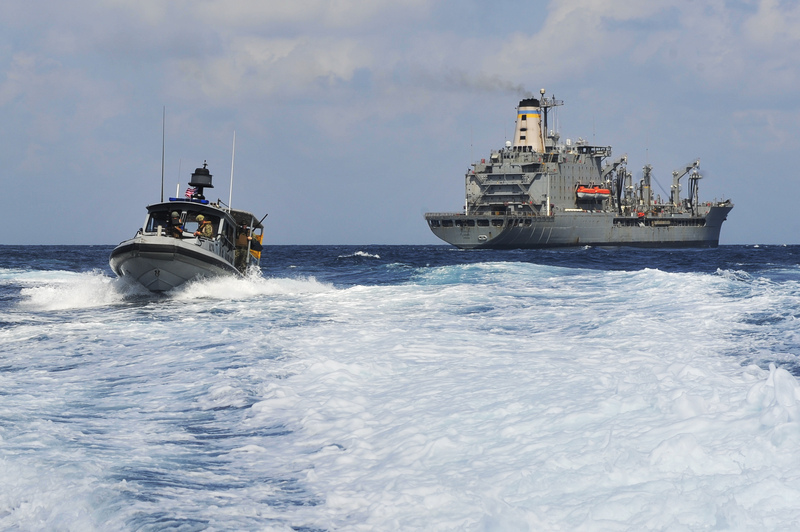 The primary mission of Coastal Riverine Force is to conduct maritime security operations across all phases of military operations by defending high value assets, critical maritime infrastructure, ports and harbors both inland and on coastal waterways against enemies, and when commanded, conduct offensive combat operations. 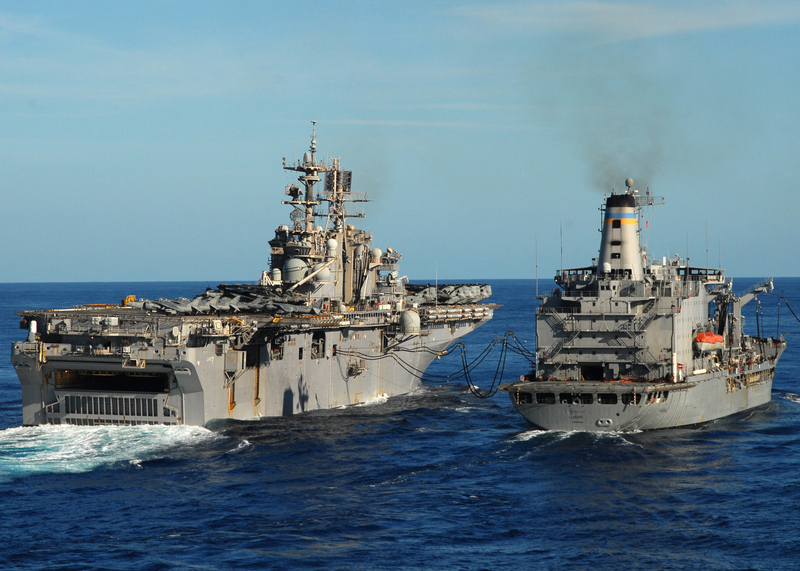 334k USS Bataan (LHD-5) comes alongside USNS Laramie (T-AO-203) for a replenishment-at-sea. Bataan and her ready group are deployed in the U.S. 5th Fleet area of operations in support of maritime security operations designed to reassure allies and partners, and preserve the freedom of navigation and the free flow of commerce in the region..
171128-N-OH262-964 ATLANTIC OCEAN (Nov. 28, 2017) 309k Military Sealift Commands petroleum tanker USNS Lawrence H. Gianella (T- AOT-1125) along-side USNS Laramie (T-AO-203) while at sea. The ships were along-side each other to perform a skin-to-skin, fuel lightering operation. 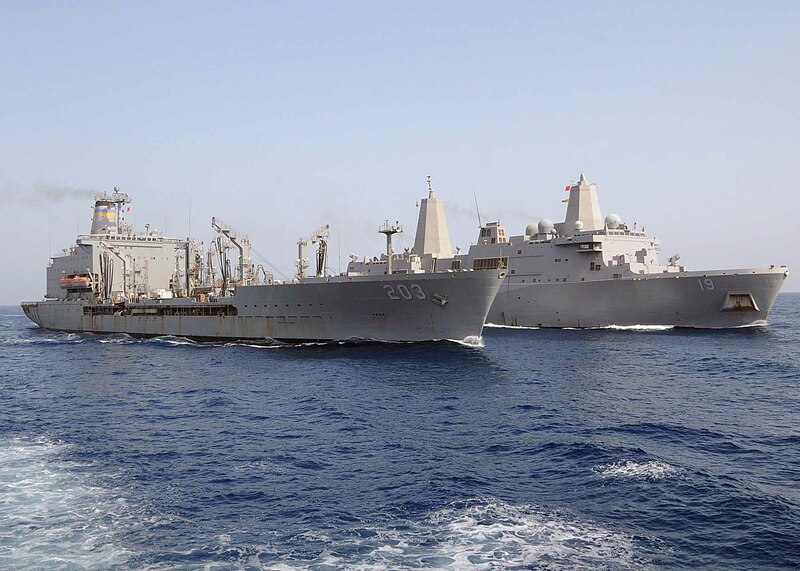 258k USNS Laramie (T-AO-203) conducts a replenishment-at-sea with San Antonio Class Amphibious Transport Dock USS Anchorage (LPD-23), right, and the Amphibious Dock Landing Ship USS Rushmore (LSD-47) during a scheduled deployment of the Essex Amphibious Ready Group (ARG) The Essex ARG is deployed to the U.S. 5th Fleet area of operations in support of naval operations to ensure maritime stability and security in the Central Region, connecting the Mediterranean and the Pacific through the western Indian Ocean and three strategic choke points. 174k Sailors assigned to Task Group 68.6 (TG 68.6) prepare to rendezvous with USNS Laramie (T-AO-203) in the Gulf of Tadjoura, 15 November 2018. 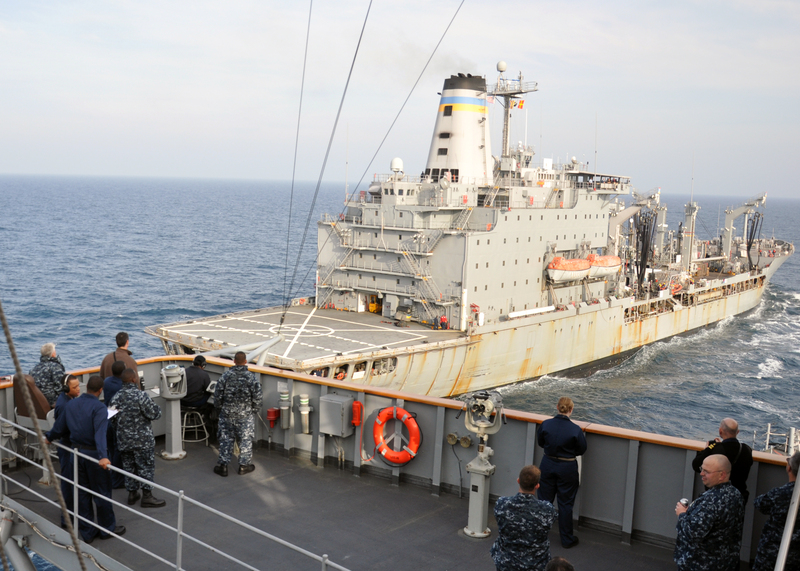 TG-68.6 is forward-deployed to the U.S. 6th Fleet area of operations and conducts joint and naval operations, often in concert with allied and interagency partners, in order to advance U.S. national interests and security and stability in Europe and Africa. 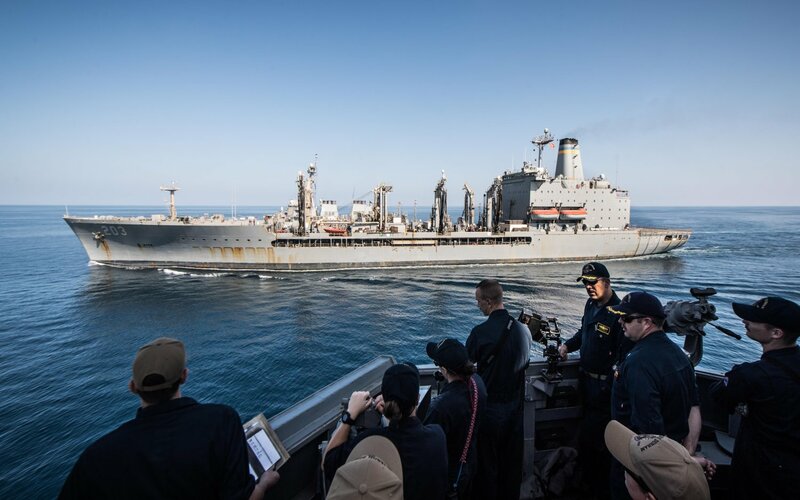 211k Sailors aboard the Arleigh-Burke class guided-missile destroyer USS Jason Dunham (DDG-109) direct the ship toward USNS Laramie (T-AO-203) to conduct a replenishment-at-sea. Jason Dunham is deployed to the U.S. 5th Fleet area of operations in support of naval operations to ensure maritime stability and security in the Central Region, connecting the Mediterranean and the Pacific through the western Indian Ocean and three strategic choke points.